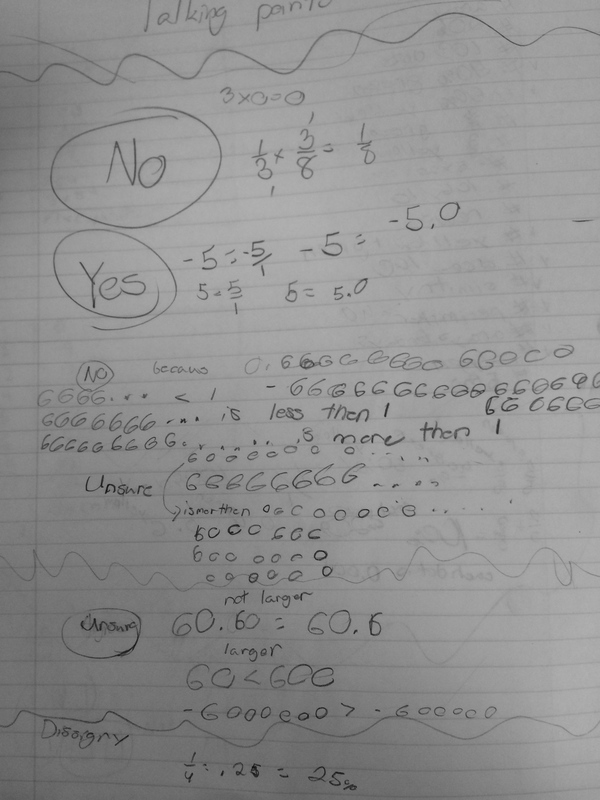 TP6: I used this point to check for equivalency understanding of fractions and percents (because we have worked with them) and then to see any connections to decimals. 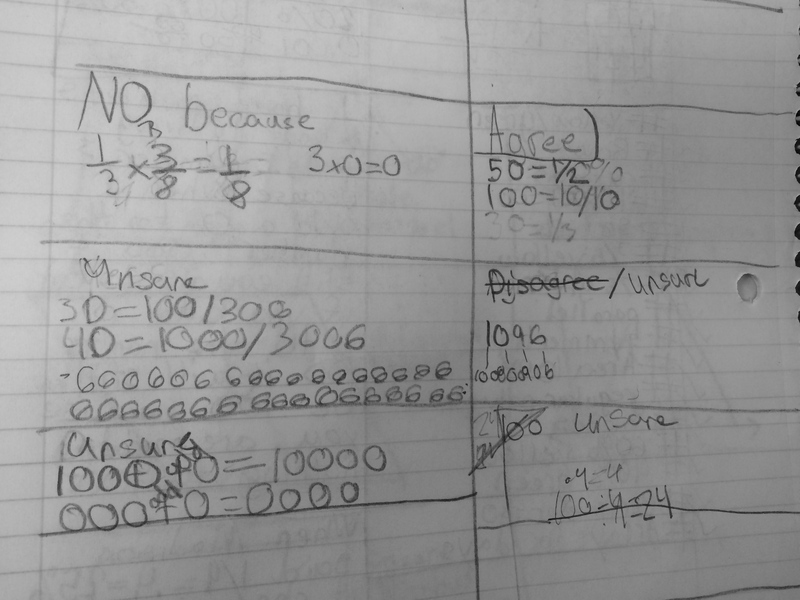 A lot times, student will take the fraction denominator and put that right behind the decimal point to make equivalents. This one was eh. 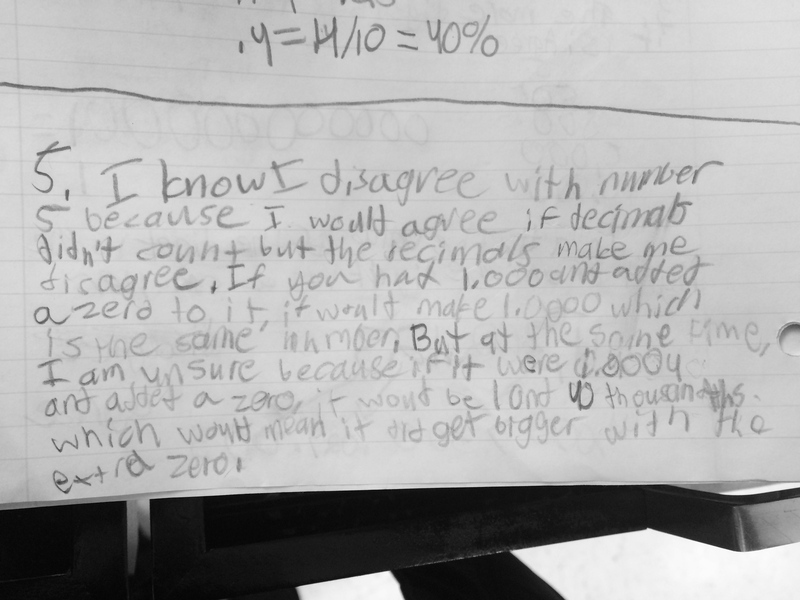 I like that students knew 1/4 = 25% so the conversation focused on the meaning of the decimal in relation to the other two. 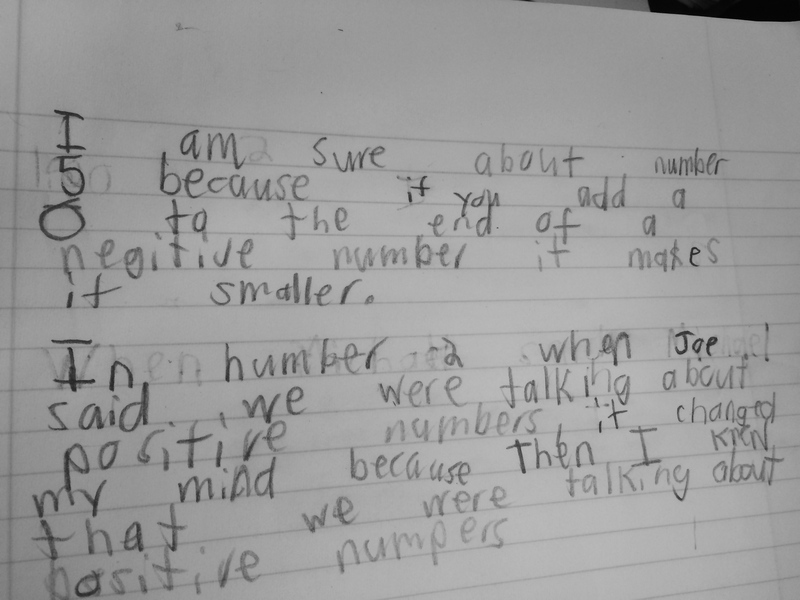 I may reword this to, “.4 = 4%” and leave it at that. 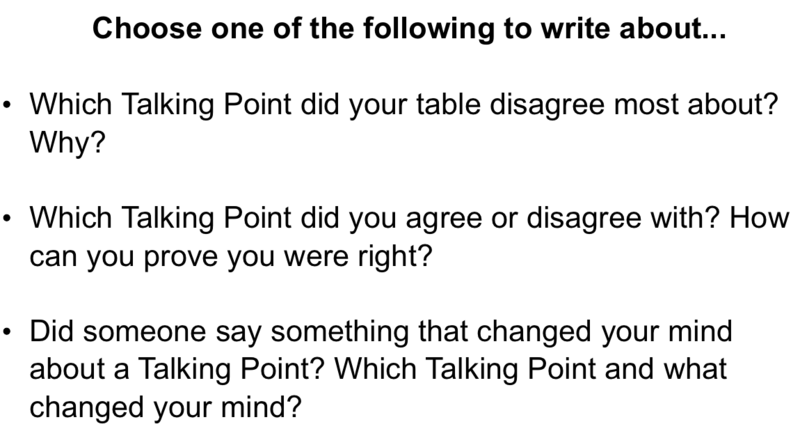 “I am still having doubts about Talking Point __- because….” and “When (insert person’s name) said ___________ it changed my mind about Talking Point ___ because…” Some samples of these are above and here are a few more…. 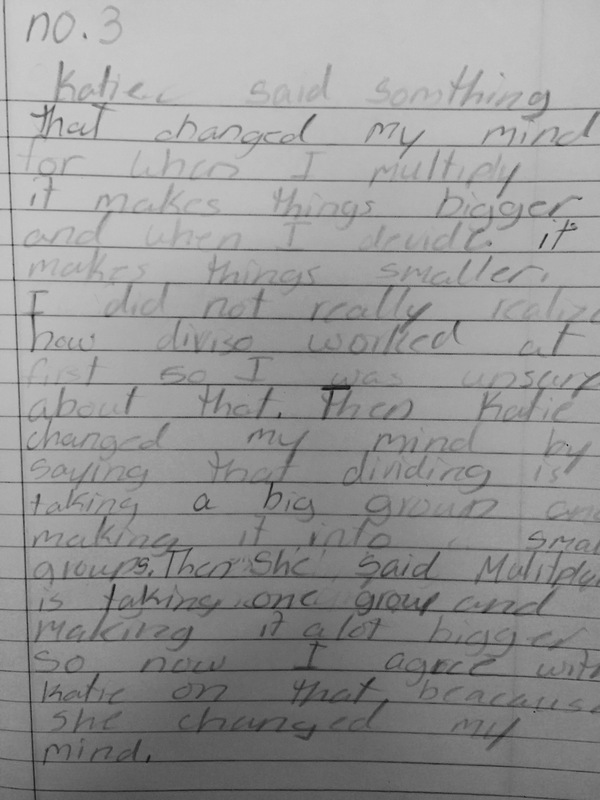 This entry was posted in 5th Grade, Decimals, Math, Talking Points on January 27, 2015 by mathmindsblog. 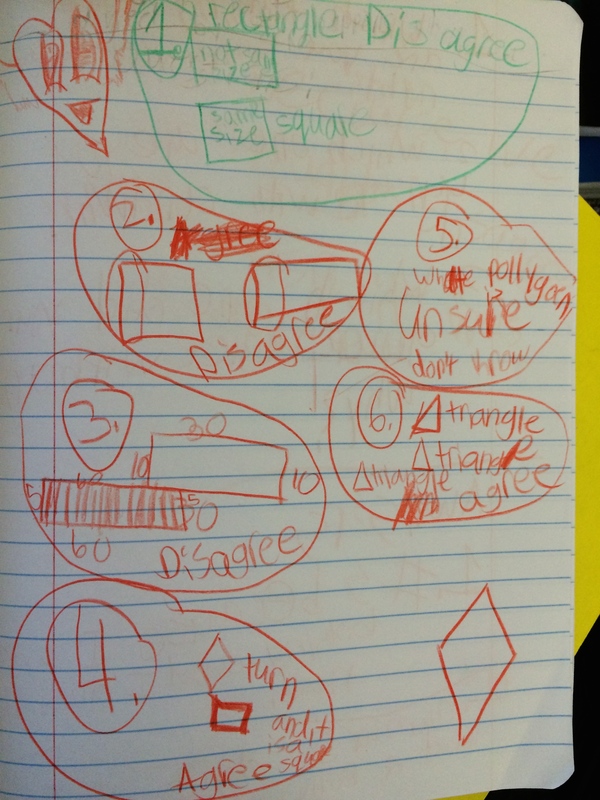 We started our 2D Geometry unit with Talking Points: https://mathmindsblog.wordpress.com/2014/11/13/talking-points-2d-geometry/. 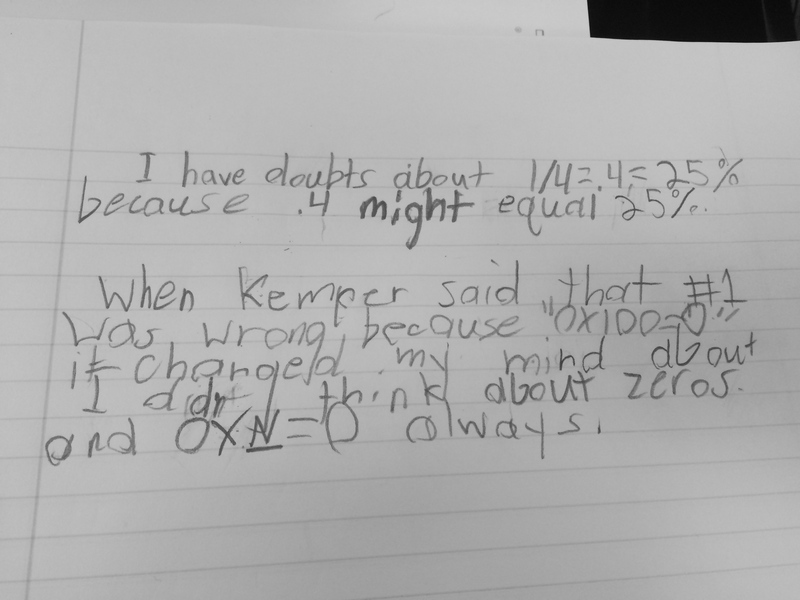 This was the ultimate pre-assessment in which I could hear what the students were thinking around mathematical concepts while at the same time, they had a chance to also hear the thinking of their peers. 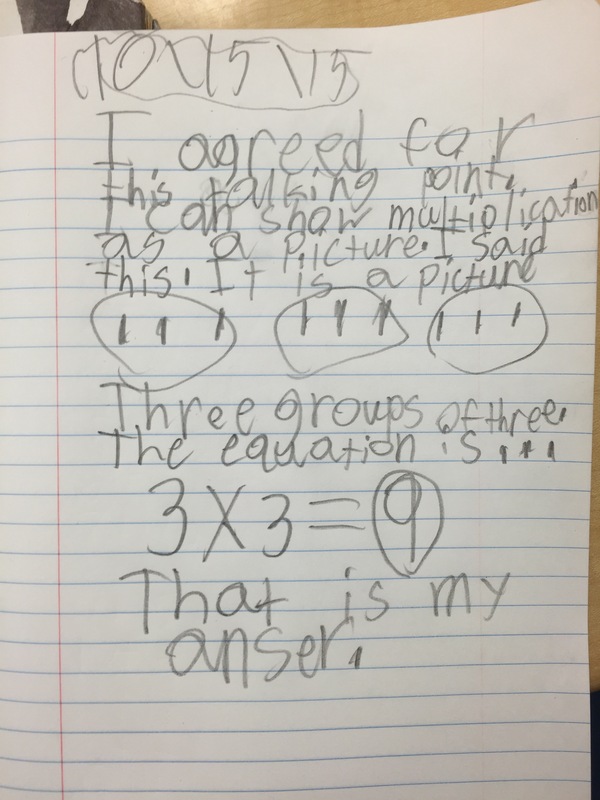 After the talking points activity, I had the students reflect on a point they were still unsure in their thinking. 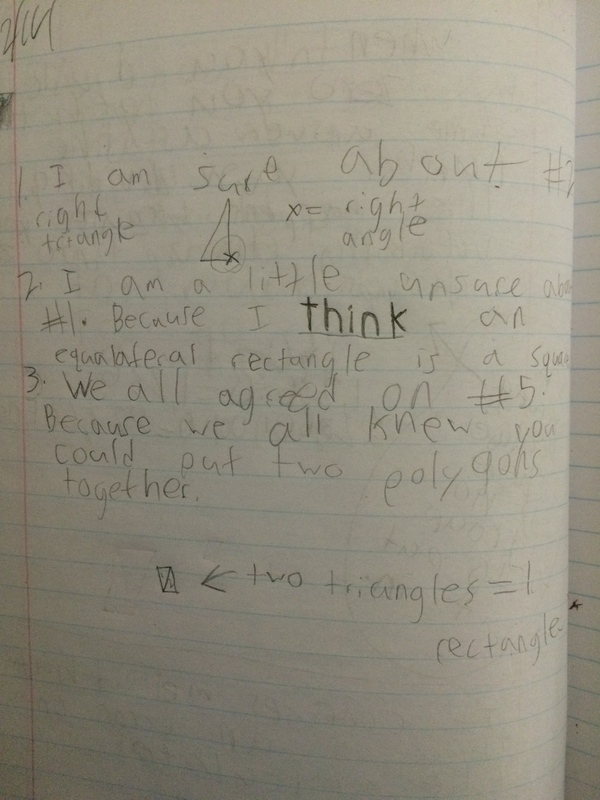 We are now wrapping up our Polygon unit, and I thought it would be interesting for them to reflect back on what they were unsure about in the beginning, and get their thoughts now. 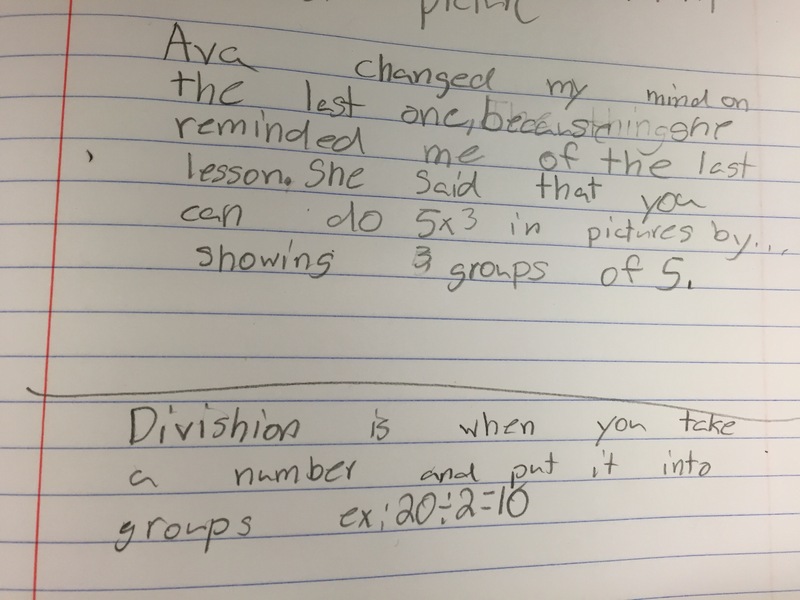 I have a class full of amazing writings, but here are just two of the great reflections (the top notebook in each picture is the pre-unit and the bottom is post-unit)…. 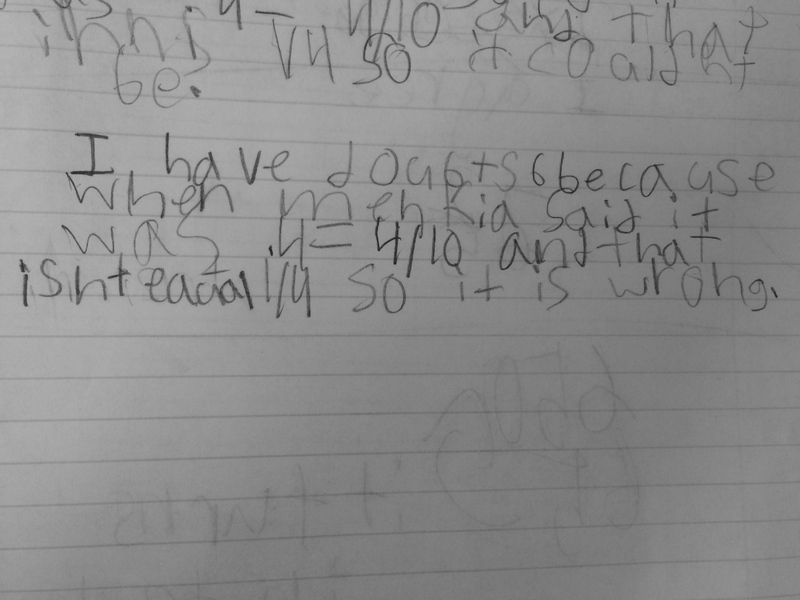 This is the first pre/post assessment I have ever done where I think the students enjoyed it as much as I did! They were as proud of themselves as I was of them! 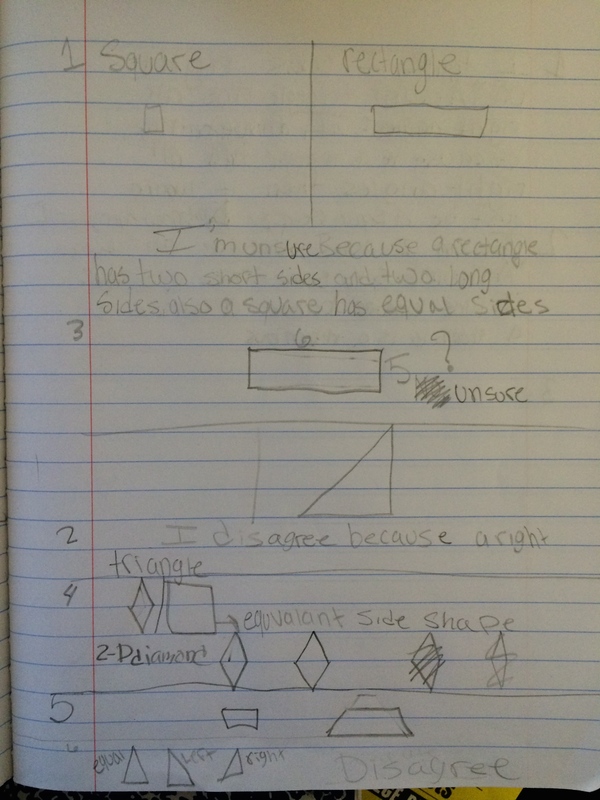 This entry was posted in 5th Grade, Assessment, Geometry, Math, Talking Points and tagged 2D Geometry unit, Talking Points on January 17, 2015 by mathmindsblog. 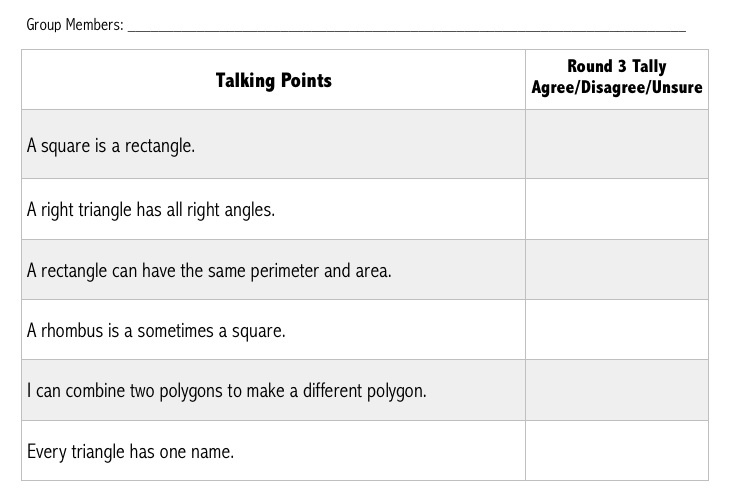 We are about to start out work with Polygons, so I decided to kick it off with Talking Points. If you have never read about them before you can check out my post or Elizabeth’s post to learn more. 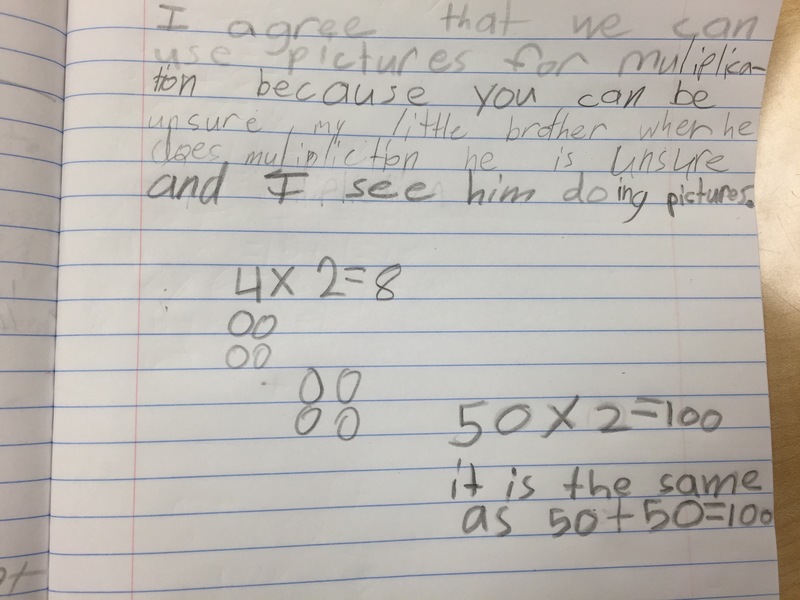 I had gotten these points by looking back at their fourth grade geometry unit work and thinking about what misconceptions or partial understandings students have each year when we start this unit. 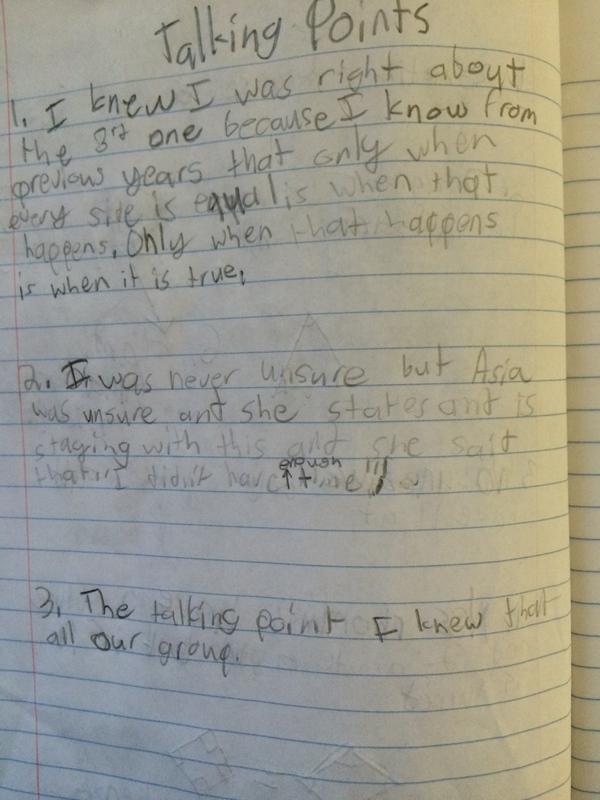 1 – What talking point are you sure you were right in your answer? 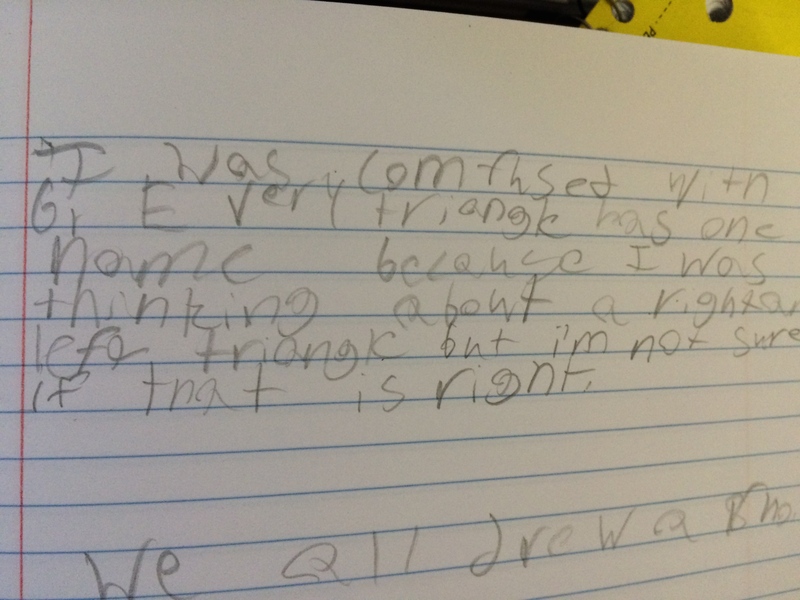 Explain your reasoning. 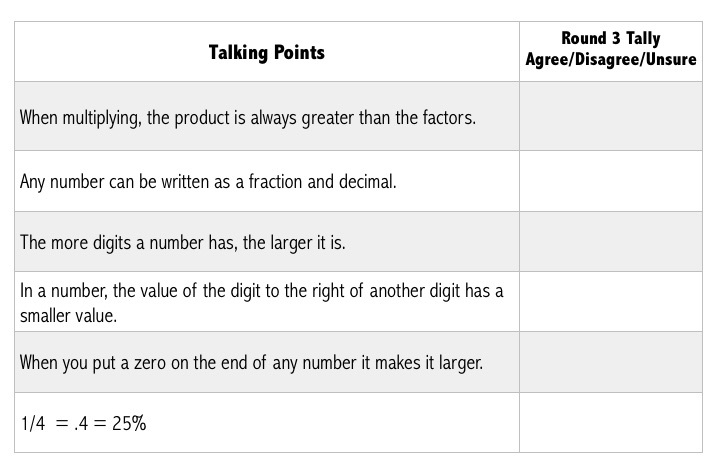 2 – Which talking point are you unsure about your answer? Why? 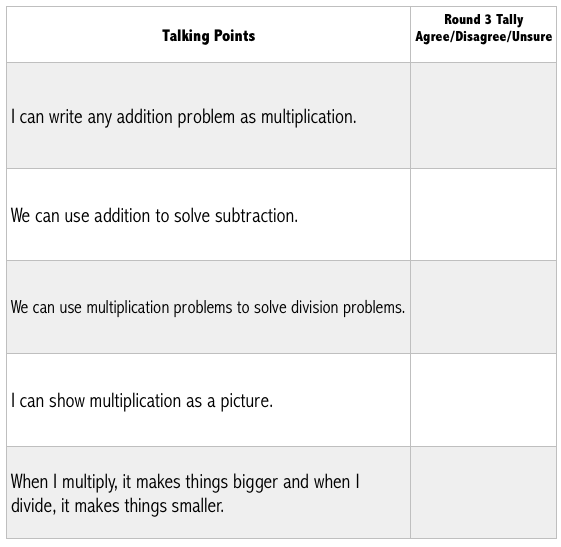 3 – Which talking point did your group agree upon easily? 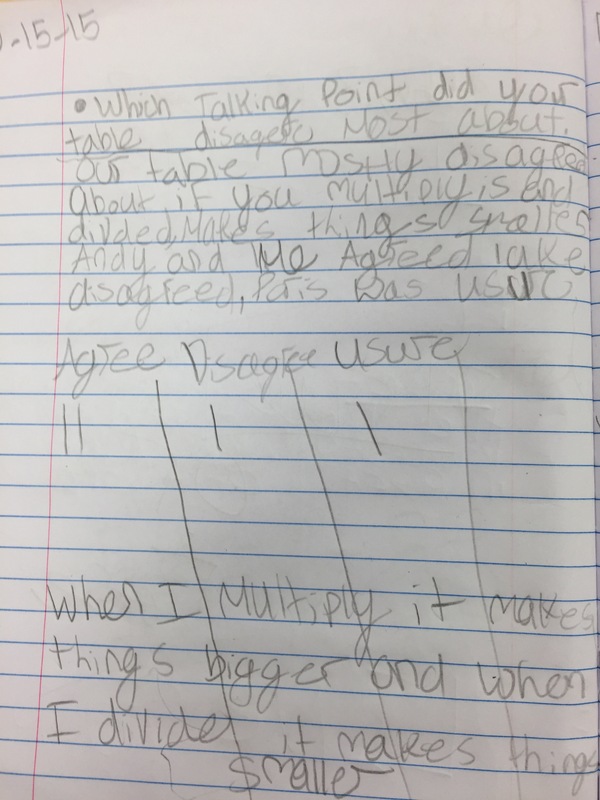 Why do you think it was easy for your group to agree on that one? 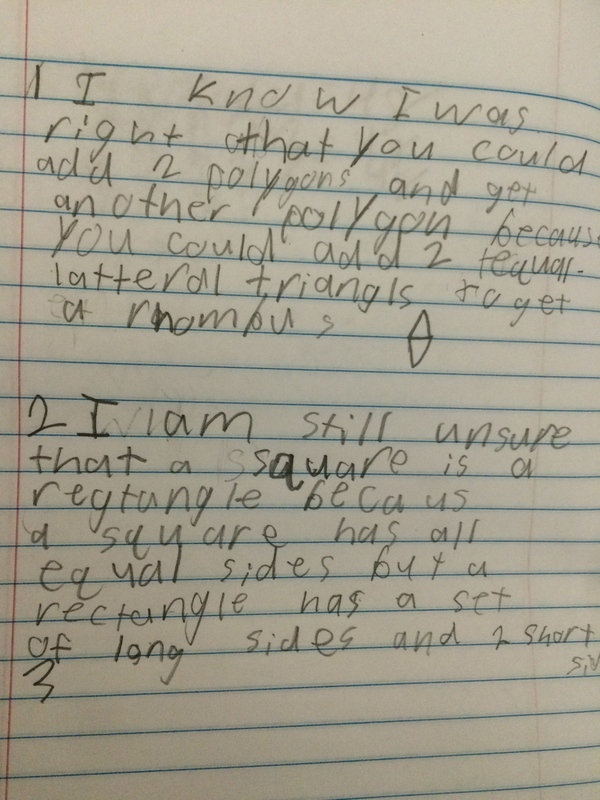 Never anticipated so much “left angle” talk in my life 🙂 I learned SO MUCH about their understandings and wish I had time right now to add my comments to each journal, but I will very soon! 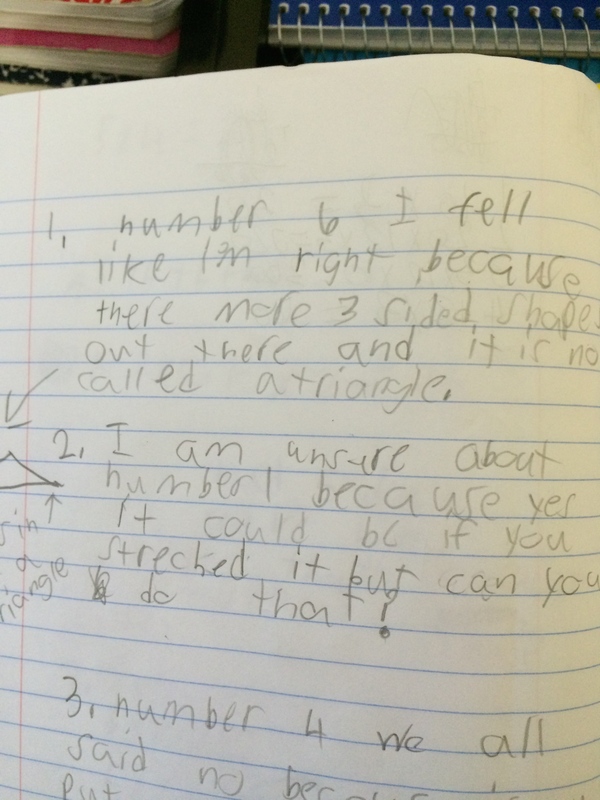 TP1 – As I anticipated, this one is always a source of confusion. 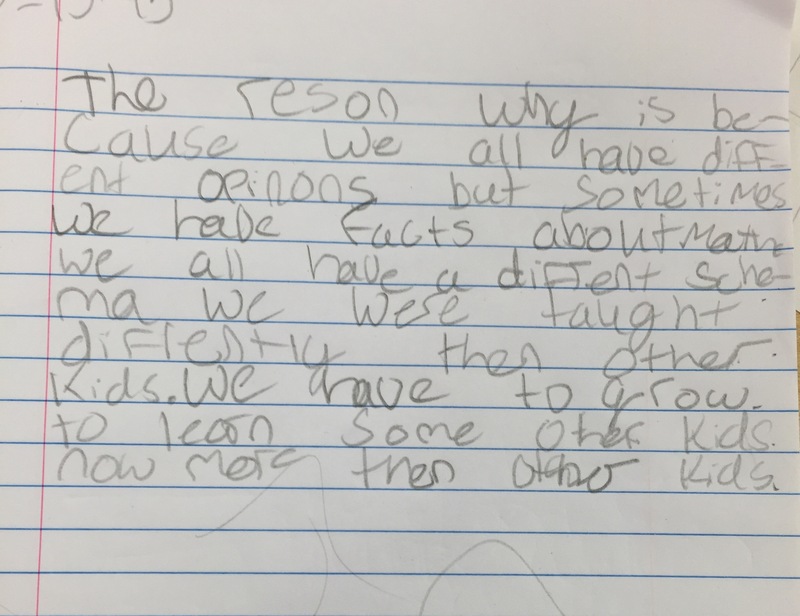 Every year it seems as if the students know the sentence goes one way or the other but can’t remember it because there is little understanding of the WHY piece. 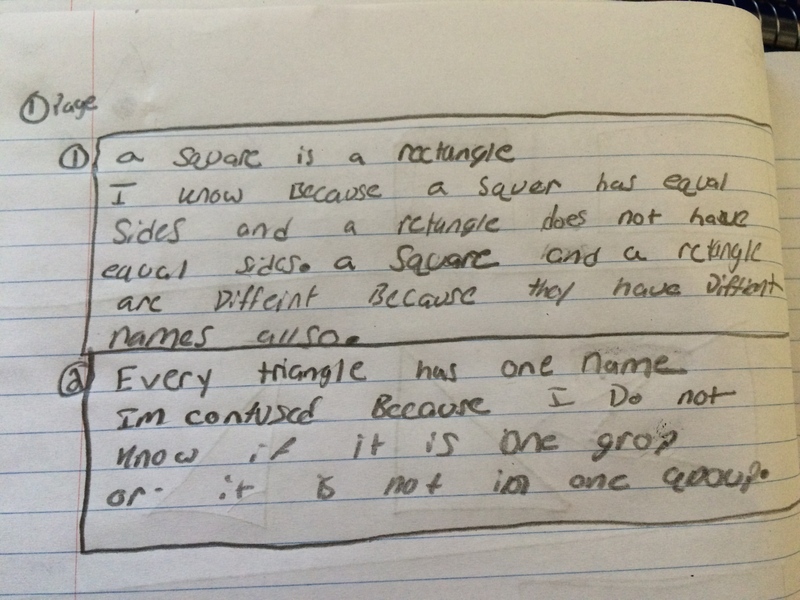 Later on in the unit after we have done more classifications, I do more of these statements with Always, Sometimes, Never, so this is a something I wanted to see how students were thinking about it. 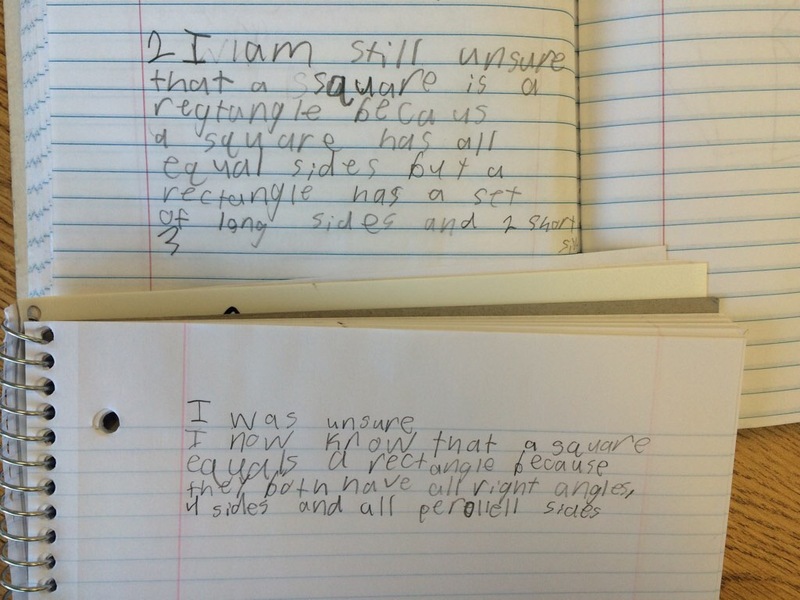 Most tables said something to the effect of “I remember last year we said a square is a rectangle or a rectangle is a square, but I can’t remember which one.” Another conversation I heard was that a rectangle has to have two short sides and two long sides. 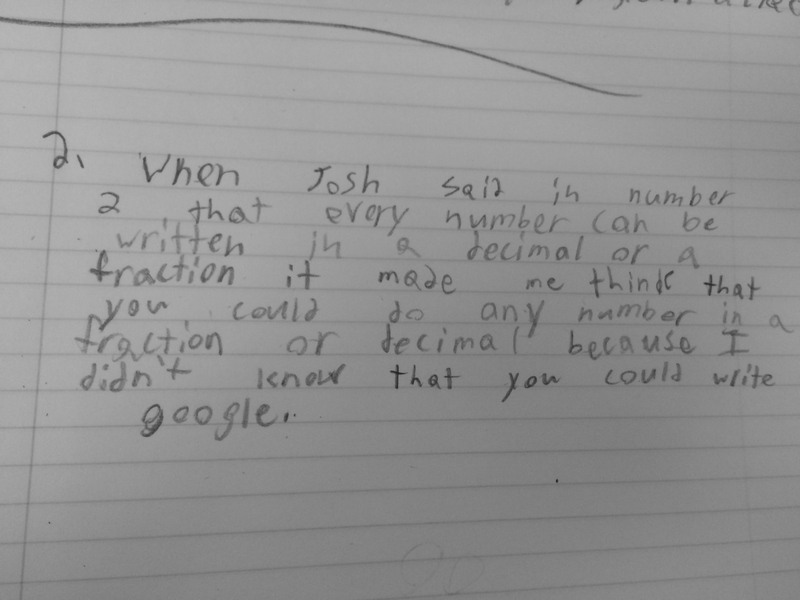 TP2: I loved this question and was really pleasantly surprised to see some trying to draw it and ending up with unconnected sides. One thing I was so surprised about was the “left angle.” They were not thinking the degrees changed so much from the left to the right angle, but more the orientation of the angle (left side, right side). Interesting. 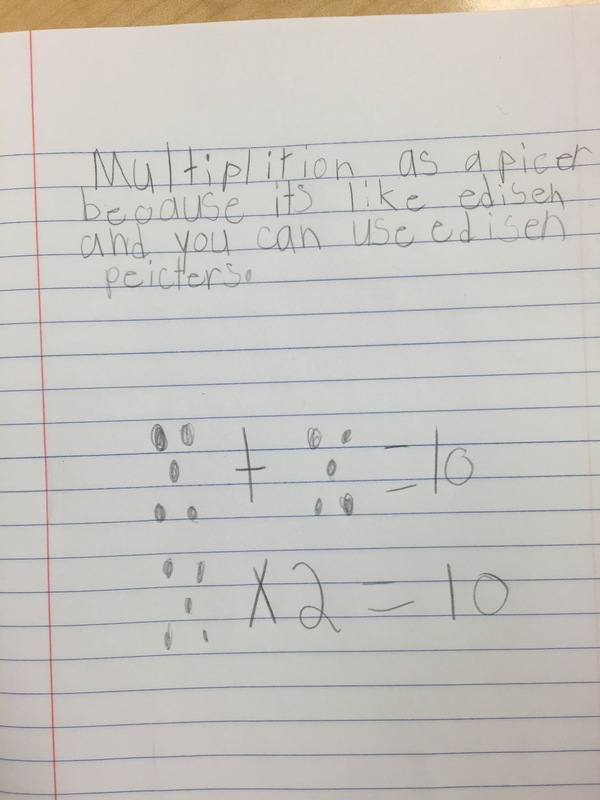 TP3: I got a great sense that most students knew what area and perimeter were and the best part was that if they didn’t remember, someone at their table did and gave an example. Regardless if they knew they could be the same, I was excited to see a great understanding from most here. 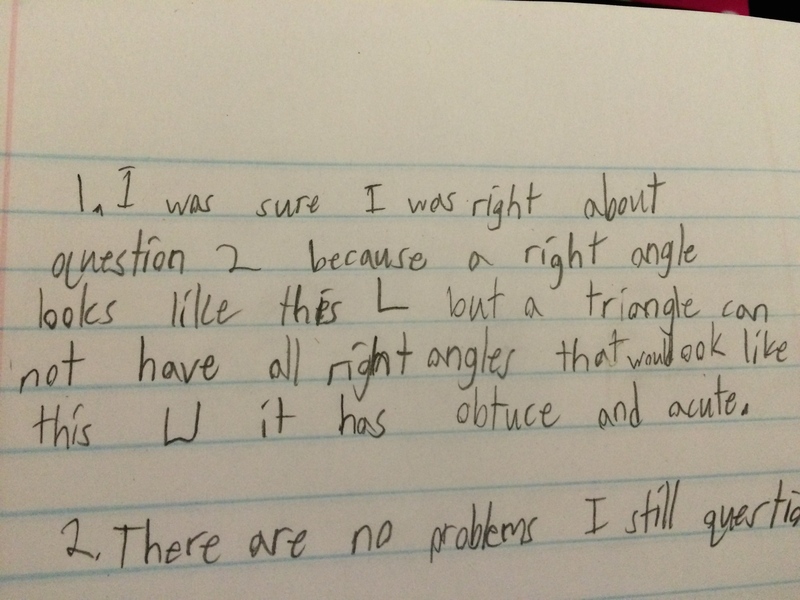 TP4: This one was great. 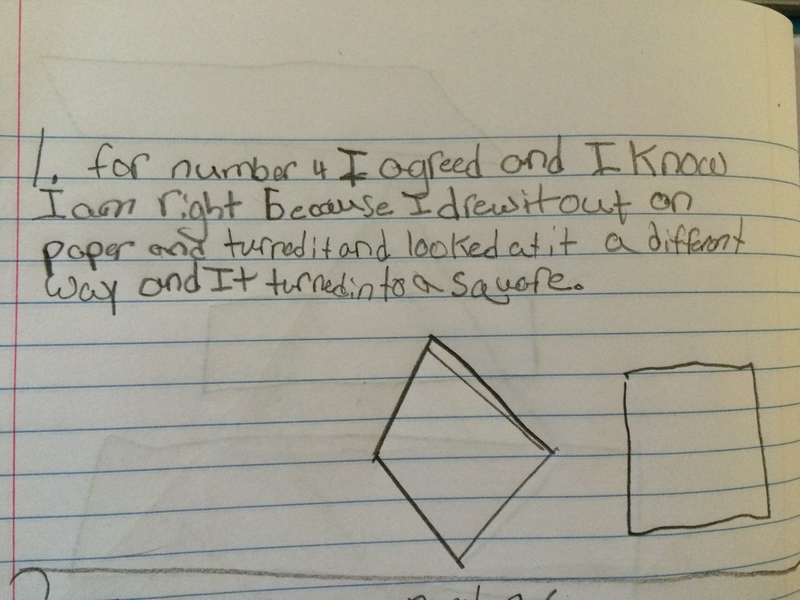 I saw some students drawing a square on their paper, showing the group, rotating the paper and saying, “See, now it is a rhombus.” They all seemed to be in the mindset that a rhombus is a diamond shape, but really not reasoning about the attributes that make it a rhombus. 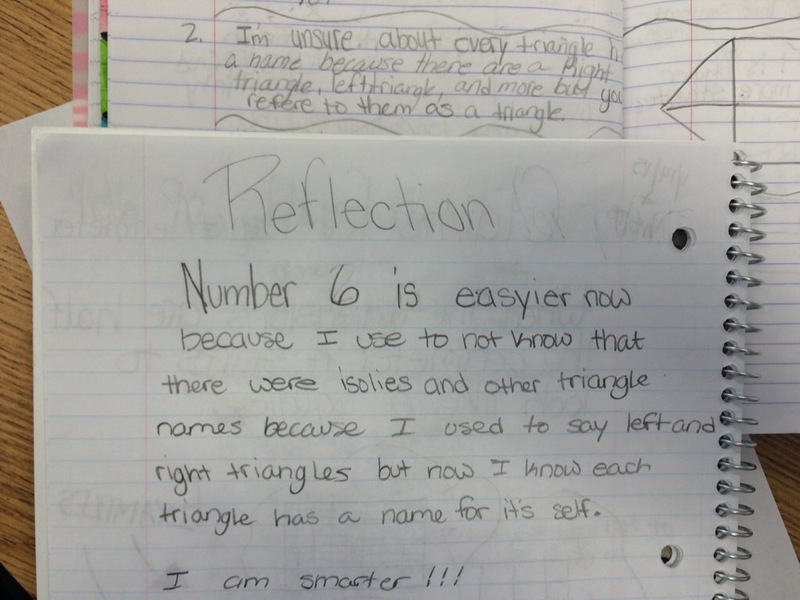 TP5: They did a very nice job with this one. 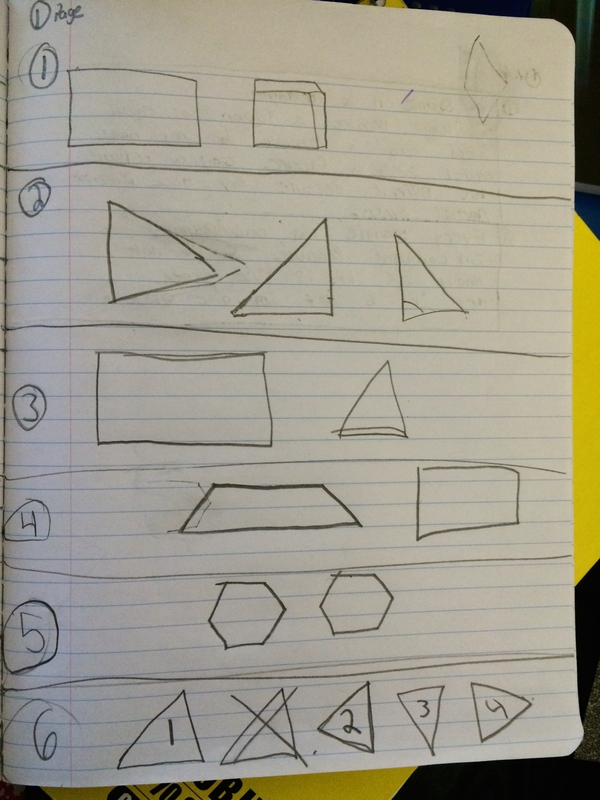 A lot drew examples of combining two shapes, while I heard others asking their group if the “inside connected side counted” when they were trying to name it. 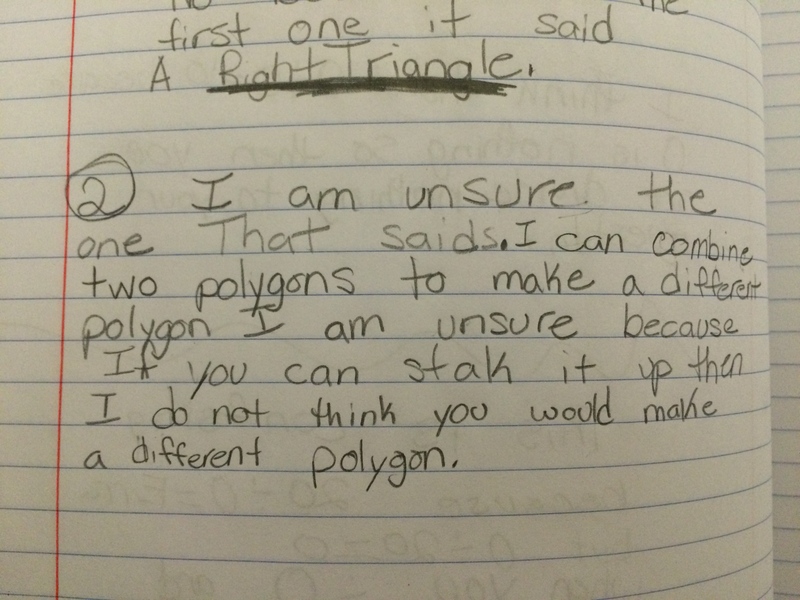 Also realized that the term polygon was not familiar to most students. 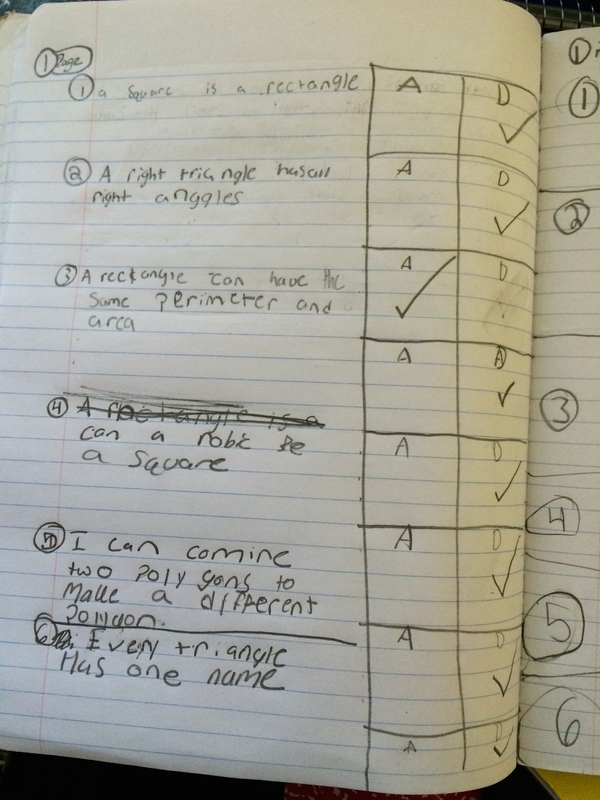 I am wondering what they called them in earlier grades? Pattern Blocks? 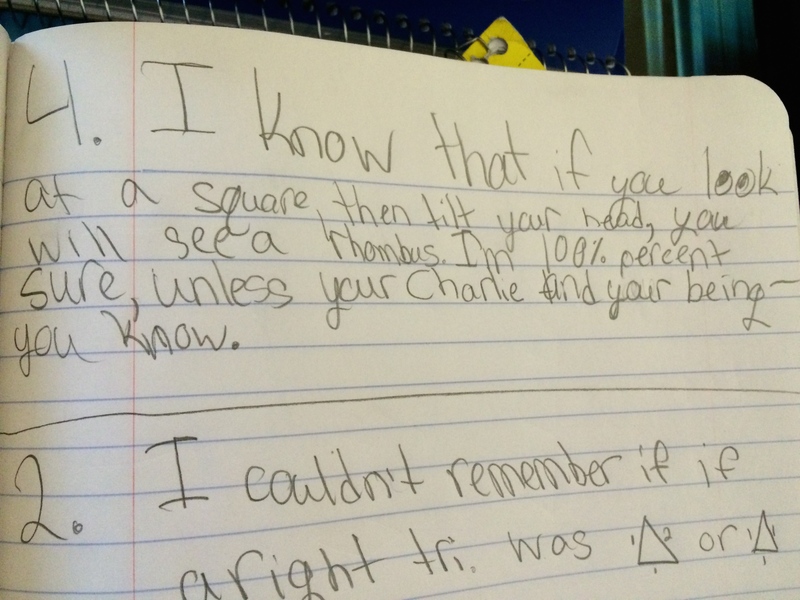 Shapes? 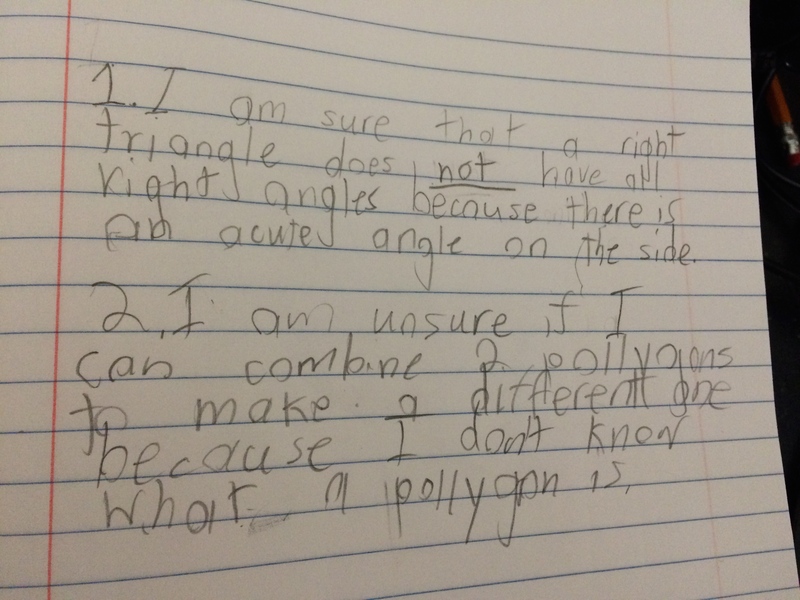 TP6: Interesting one here and it is where we start our 5th grade work with polygons, classifying triangles. 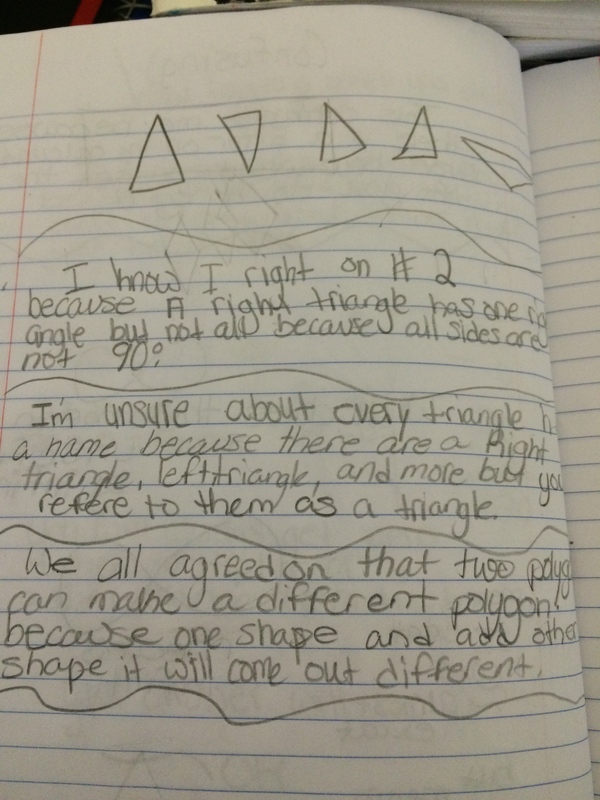 Again, the left angle reappeared:) I did hear a few struggling with the name of the angles, obtuse, acute, right but then I had some that said there are other 3-sided shapes that aren’t called triangles. Hmmm, can’t wait to find out what they are! 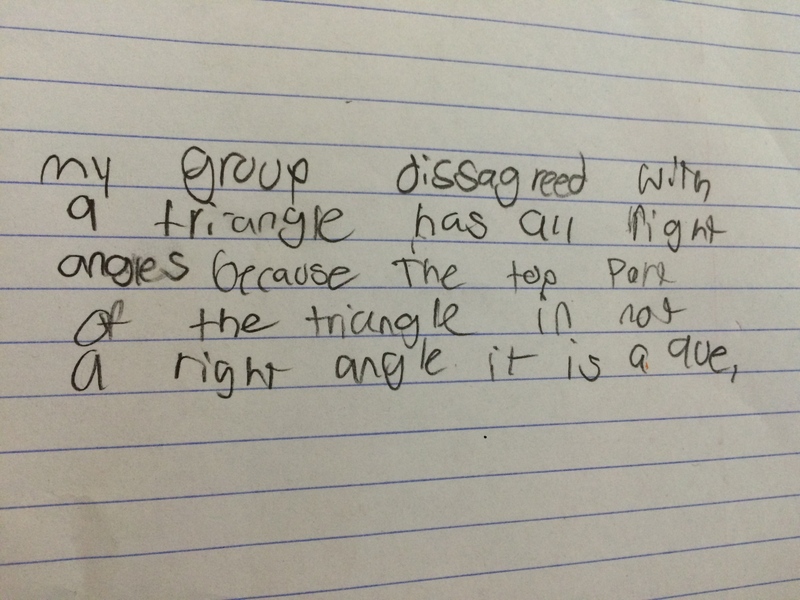 Of course, you always have your comedians who say agree because it could be Bob or Fred. Can’t wait to start planning this weekend! 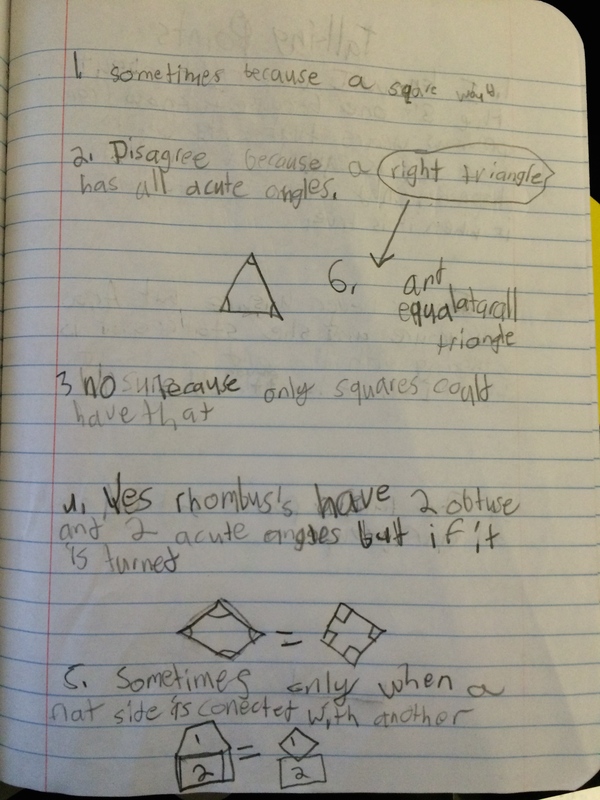 This entry was posted in 5th Grade, Geometry, Talking Points, Uncategorized on November 13, 2014 by mathmindsblog.